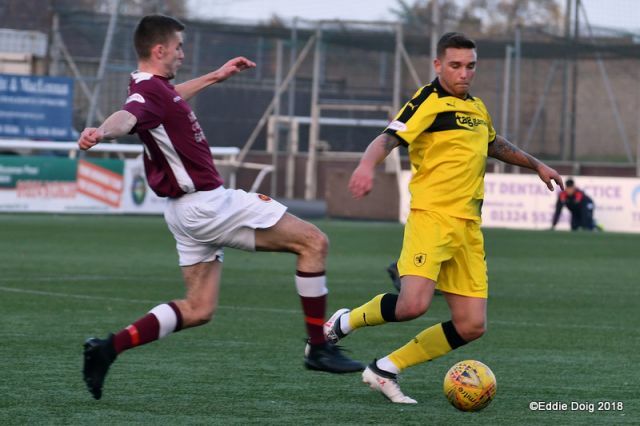 Two goals from Daniel Armstrong and a third from Callum Crane sealed a deserved victory at Ochilview against a spirited Stenhousemuir side, as Raith consolidated their second position in this year’s Scottish League One championship race. 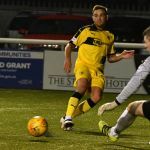 Although Mark McGuigan pulled the Warriors to within a goal mid-way through the second half, Raith’s quality told in the end, with Armstrong restoring the two goal margin of victory late on. 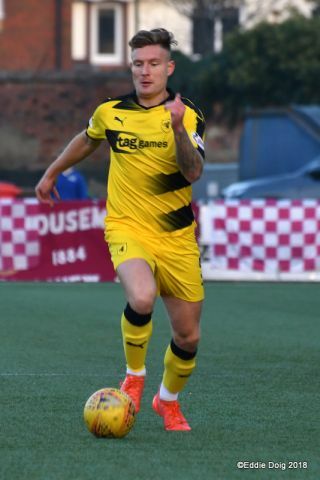 With Raith looking to arrest a run of two consecutive away defeats, Manager McGlynn pushed Buchanan up alongside Nisbet, with Flanagan and new signing Armstrong left and right. 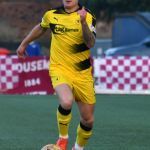 The latter danced in from the right touchline with Raith’s first noteworthy attack – tge experienced Morgan Neill alert to the danger. 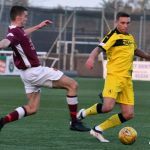 Callum Crane and Ross Matthews patrolled the centre of midfield – with Wedderburn and Hendry both absent, the vibrancy in the centre of the Raith formation was welcome indeed. 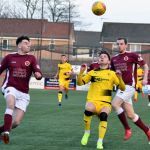 Sitting at the foot of the table, and having recently parted company with manager Brown Ferguson, Stenhousemuir were looking to reverse a recent dip in form. 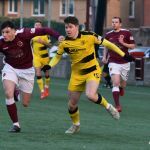 With several notable victories under their belt – aided primarily by the goals from Mark McGuigan – the Warriors had suffered several narrow defeats, and were entitled to think their lowly position told less than the story of their season to date. The home side looked to play a high line from the start, Neill and McBrearty constantly urging their troops to half-way. Nisbet and Buchanan looked along the line, anticipating space. Flanagan was first to escape, McBrearty clearing under pressure. 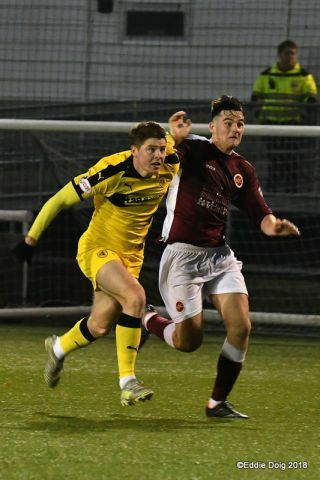 Stenhousemuir’s early play flowed through Duthie, a muscular presence at inside right. 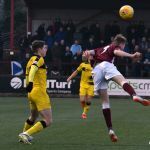 Relishing the aerial battle against Benedictus and Davidson, Duthie linked well with McGuigan in the fifth minute – Davidson looked lively, tackling well. 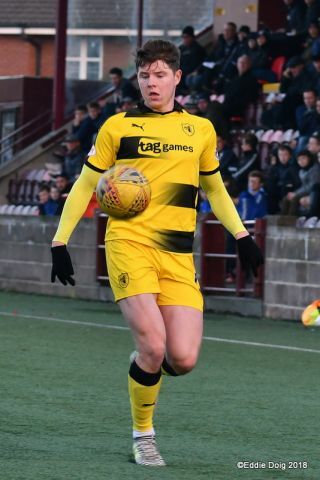 With eleven minutes gone, Raith put their noses in front with a first Rovers goal for Daniel Armstrong. 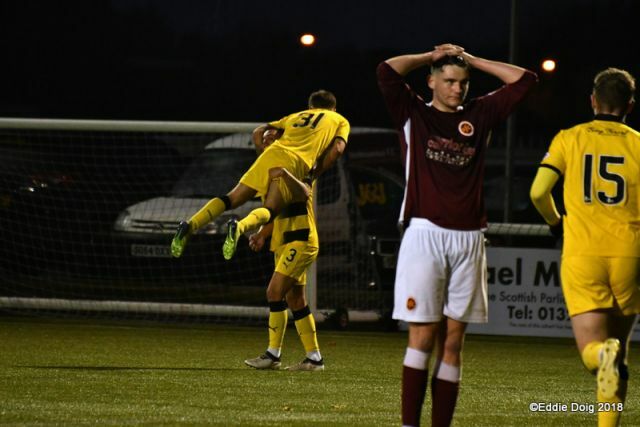 Nisbet escaped into space behind right-back Reid. 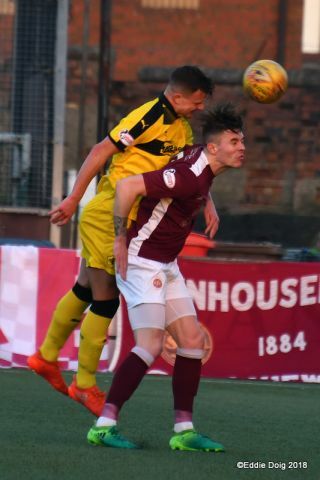 His sharp-cross was met by Buchanan, and with the deflected header bouncing in the box, Armstrong finished well under pressure from McBrearty. 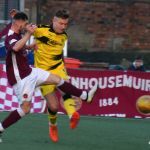 A moment later, the youngster fired again at keeper Smith, the Stenhousemuir man saving well low to his left. 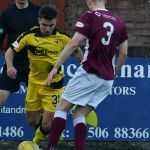 The first quarter of the match had passed, with Raith looking in command. 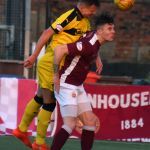 Flanagan and Nisbet looked busy, and Armstrong looked menacing with every touch. 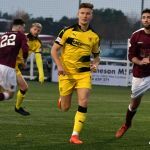 With chalk on his boots (notwithstanding the artificial surface), the youngster looked to drive forwards with every foray into home territory. 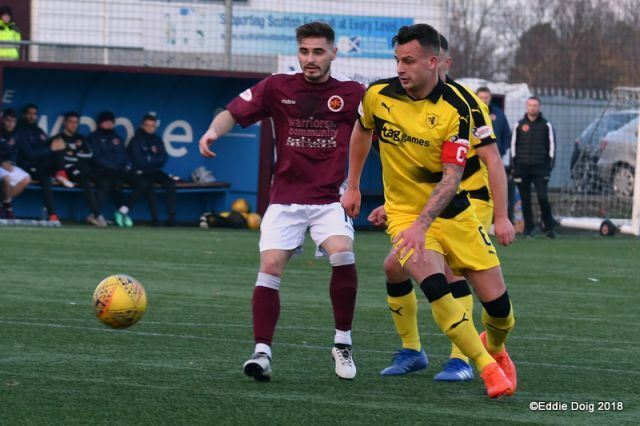 Appearing on the left-flank following Benedictus’ pass through midfield, Armstrong again forced McBrearty into urgent action. 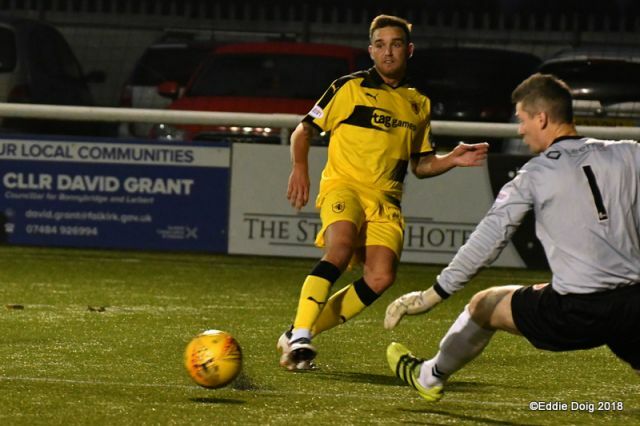 Benedictus thumped a volley into Smith’s side-netting on nineteen minutes. 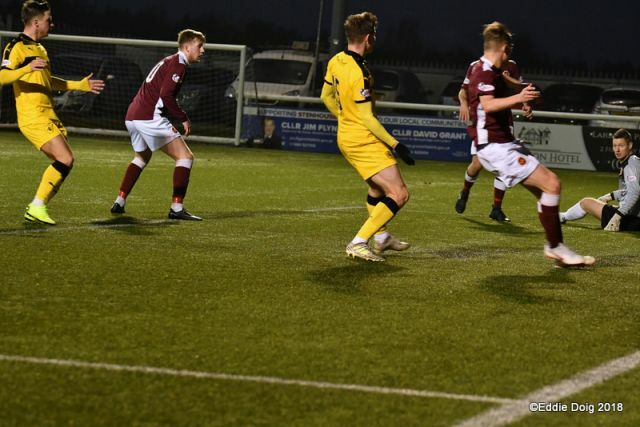 The Warriors’ first real chance came half-way through the opening period, McGuigan’s header gathered comfortably by Thomson. 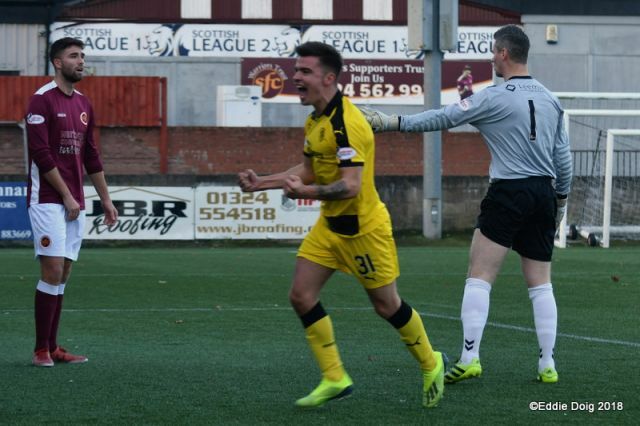 Paton looked to get beyond Murray, crossing twice into the heart of the Rovers’ six-yard box. 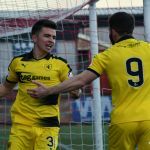 With the home side struggling to retain possession in midfield, Raith withstood the minor onslaught. 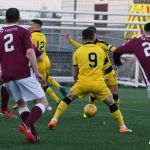 With Armstrong whipping a cross through the are on the half-hour, Benedictus blasted narrowly over from six-yards, through a crowded box. 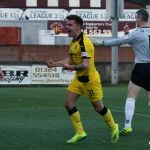 The anguish on the defender’s face suggested Raith knew they were on top, and yearned the security of a second goal before half-time. McGuigan was narrowly adjudged off-side following Reid’s centre. 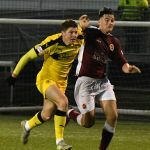 With the autumnal skies shining pink behind the North Stand, and temperatures crisp, the match had developed a steady rhythm – Flanagan Nisbet and Armstrong all looked spritely, springing their defensive cover at every opportunity; for the Warriors, McGuigan remained the main threat, jostling with Davidson and Armstrong, looking to get others forward from midfield. 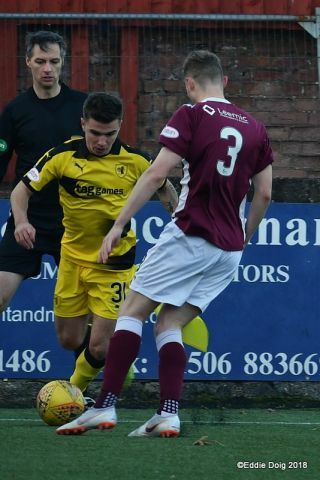 Paton got the better of Matthews in midfield, allowing Ferry to cross – Thomson commanded his area well. 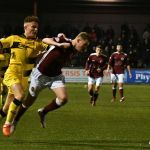 On forty minutes, Buchanan scampered in behind McBrearty, his first-time cross tempted Nisbet, keeper Smith just winning the contest. 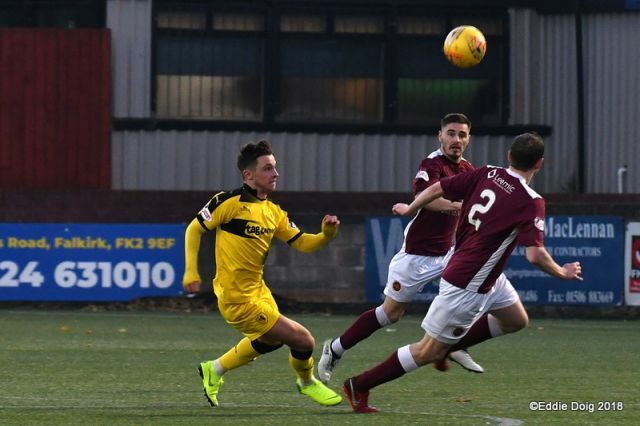 At the other end, a clear strike for Duthie, just wide – Davidson misjudged a header on half-way, allowing Paton to surge forward, opening the way for Duthie’s strike. 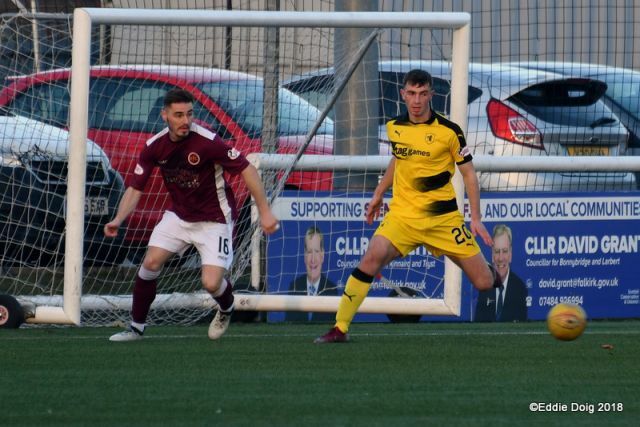 Ferry’s drive from distance failed to trouble the Raith keeper. 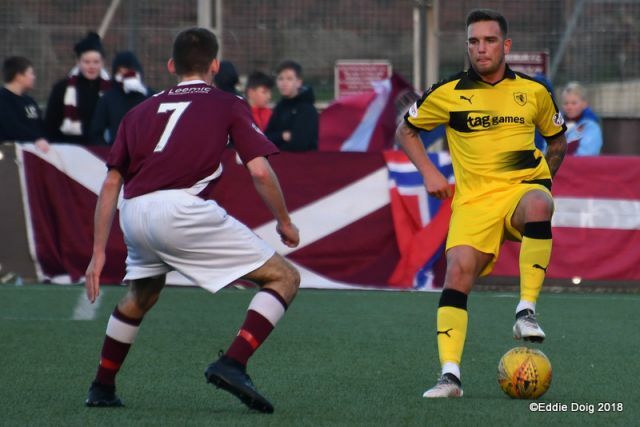 The home side ended the half with their best spell – left-back Donaldson’s lung-bursting run produced a clear shot on goal for Paton. Showing a lack of composure, the midfielder couldn’t keep his shot on target, his effort flying high and wide. 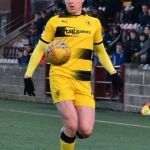 As the teams migrated toward the warmth of the dressing-room, the home side were still very much in the game; Raith manager McGylnn ruing a series of missed chances as Rovers perhaps failed to capitalise on their early superiority. Rovers came flying out of their blocks in the second half. Armstrong, driving inside, fired a left-footed strike at Smith. Buchanan’s near-post flick narrowly evaded Nisbet arriving behind. 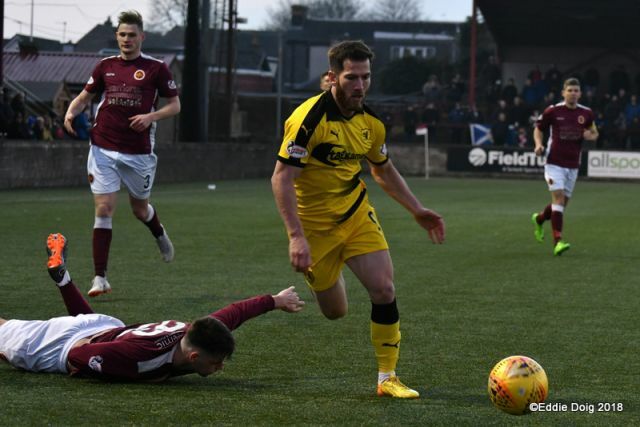 McGlynn had clearly sent his team out to secure all three points. 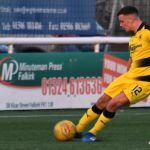 A good penalty shout for Rovers on fifty-two minutes – Buchanan showing good pace to escape Donaldson, and with both jostling on the touchline and Buchanan in front, both tangled and fell. 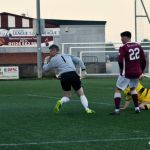 After a moment’s consideration, referee McKendrick awarded a goal-kick. 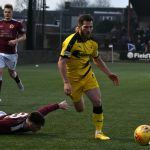 Warriors’ left-back Donaldson opened the second-half in combative mood – having been exposed several times in the first half, the defender grappled and jostled with his opposite number. 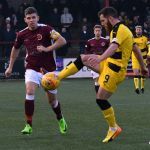 Although Armstrong clearly had the better of the encounter, Donaldson manfully stuck to his task for the ninety minutes – without his endeavours, the end result may have been a more convincing win for the visitors. 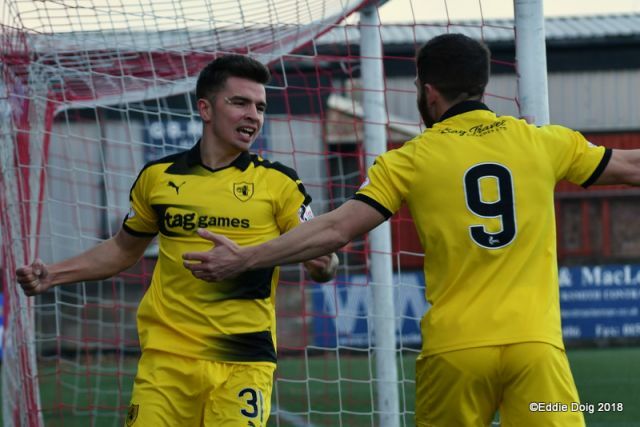 Before the hour, the second goal Raith had craved, with Callum Crane finishing well past Smith from twelve yards. 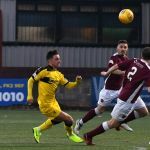 Buchanan escaped in the inside left channel, and – sidestepping McBrearty’s despairing lunge – set up his colleague for Raith’s second. Rovers had their tails up. 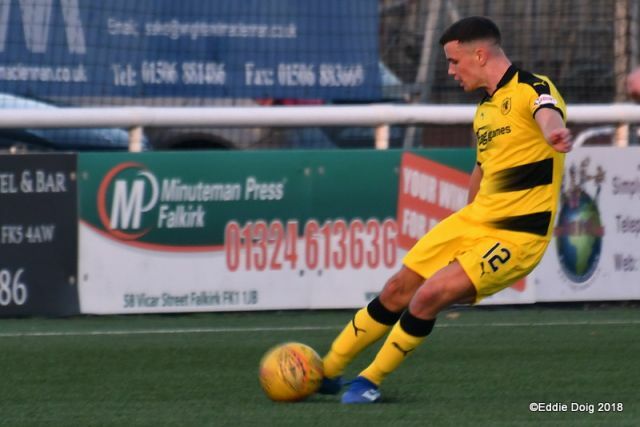 Under the Ochilview floodlights, it was Flanagan next to try his luck, after Armstrong created an opening for a shot on goal. To their credit, the Warriors pushed on despite the loss of the second goal. 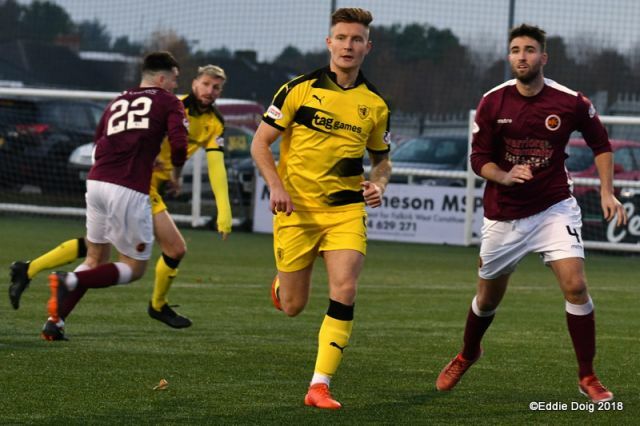 Gibbons pressurised Crane into a mistake in midfield, with only Thomson’s quick sprint from his line rescuing the Raith man’s blushes. 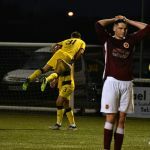 Moments later, another defensive lapse gave Stenhousemuir the goal their endeavours merited. 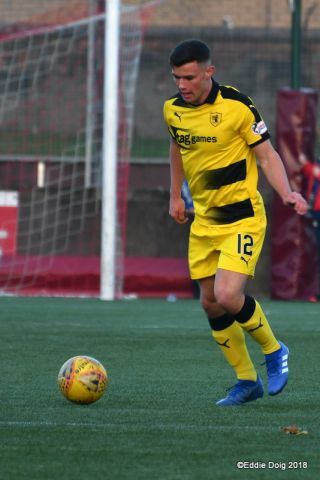 On sixty-seven minutes, Duthie’s deep ball was mis-read by Davidson, allowing McGuigan to nip in and lob over the advancing Thomson. 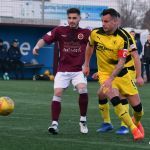 A fractious spell ensued – Matthews traded tackles with Gibbons in the centre of the park; Davidson and McGuigan grappled under every high ball; Neill and Murray clattered into a challenge on the touch-line, both feeling the full force of the others’ momentum. 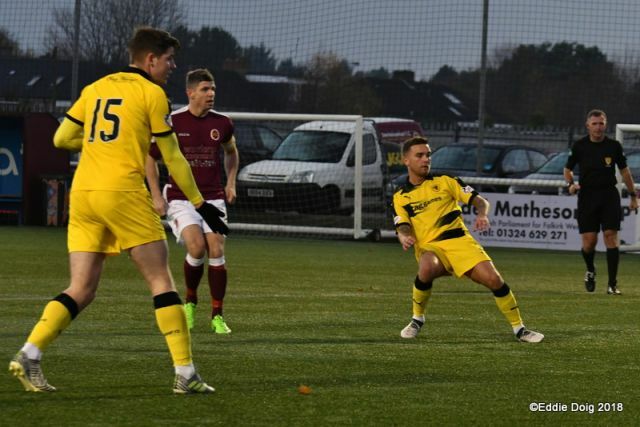 Nisbet’s drive was well save by Smith; at the other end, Paton struck a firm shot into Thomson’s midriff. 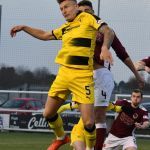 With quarter of an hour to go, Raith’s front three combined with a slick move – Buchanan releasing Armstrong, whose cross was cleared away by Duthie with Nisbet lurking. 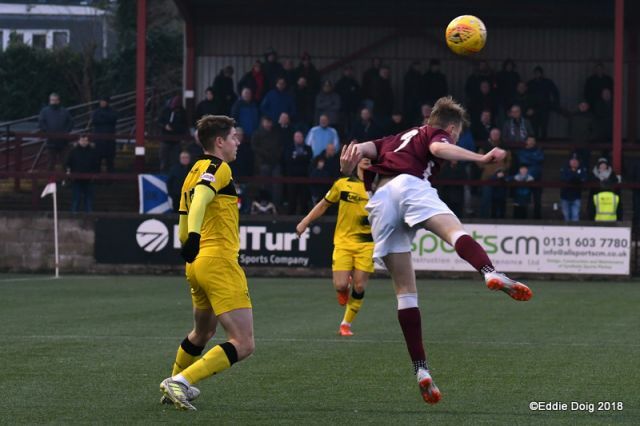 Stenhousemuir were creating half-chances too – Donaldson controlled Duthie’s deep free-kick, narrowly missing McGuigan with his chip back across goal. 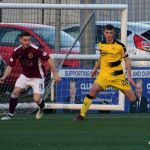 As the match entered its last five minutes, it was the Warriors pressing with Raith looking dangerous on the counter. 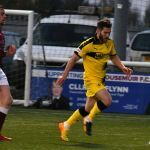 One escape allowed Flanagan to sprint clear, crossing for Nisbet only to be denied by a last-gasp intervention from Donaldson. 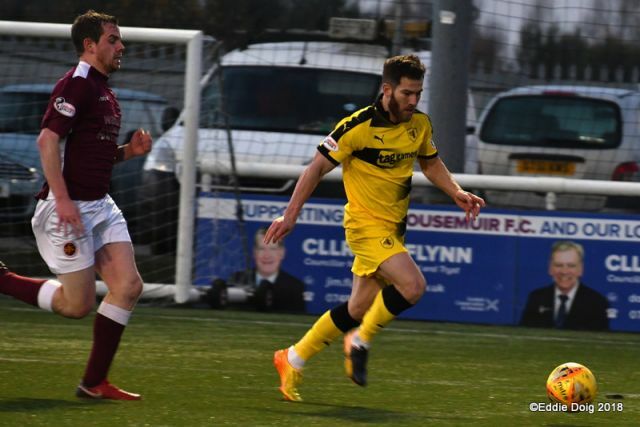 From the corner, a Raith third – Armstrong set himself, and curled a lovely chip beyond Smith into the far corner. 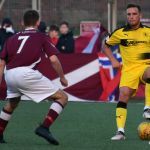 Raith fans chanted and cheered loudly from the North Stand – the three points surely now in the bag. 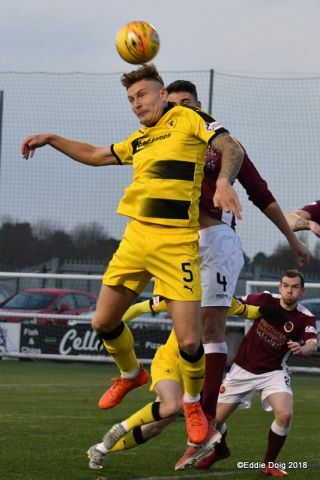 Flanagan’s late drive flew over, as Raith managed to see out the remaining minutes. 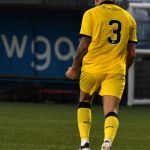 With the final whistle greeted by loud cheers from the travelling fans, both sets of players took the plaudits of their fans – Rovers’ quality and pace in the final third deservedly earned the three points, although the Warriors posed problems to the end. 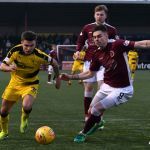 A tricky away trip safely negotiated, Rovers continue in their pursuit of Arbroath in the League One championship race. Welcome to Ochilview Park, Larbert, it's 12 degrees and slightly overcast. 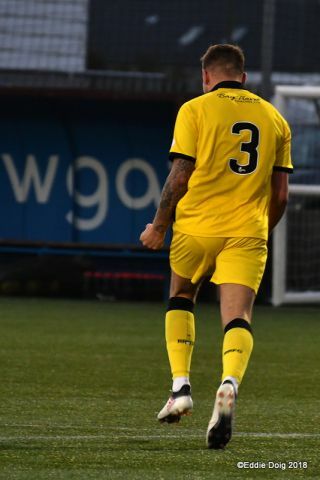 Rovers playing in the Tag Games away strip today. The early exchanges sees the ball punted back and forth. Rovers doing most of the defending thus far, need to keep the ball on the deck. Nisbet with a threatening run along the bye line sees his cut in cleared. 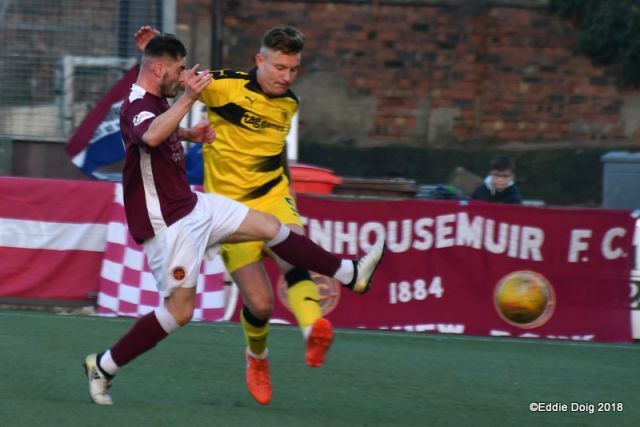 Nisbet with a cross, Stenhousemuir failed to clear and Armstrong heads Rovers into an early lead. Rovers playing with their tails up now. From a corner Benedictus slams the ball into the side net at the back post. Updates dropped off due to a server issue, hopefully thats us up and running now. Rovers supporters behind the goal in full voice. 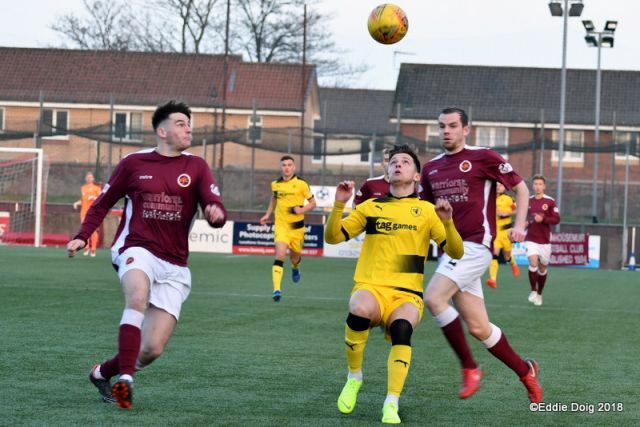 Stenhousemuir trying to salvage the half, pressing in numbers. Reid off, Vaughan on. 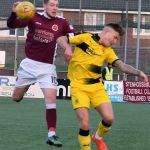 For Stenhousemuir. An error in defence sees Thomson rush out to stymie McGuigan. 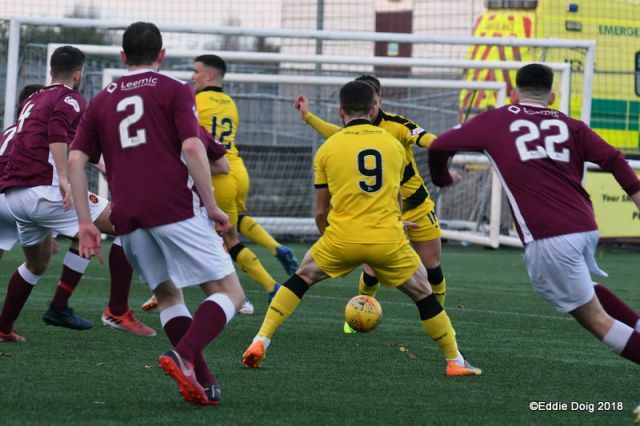 Goal Stenhousemuir. 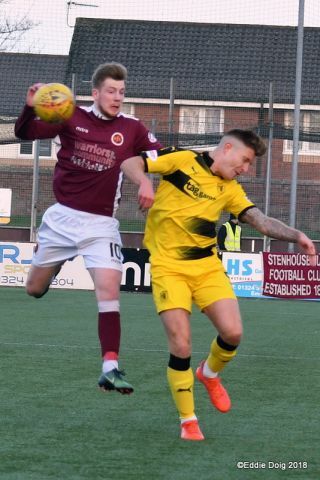 A slack back pass frll to McGuigan who chipped Thomson to score. 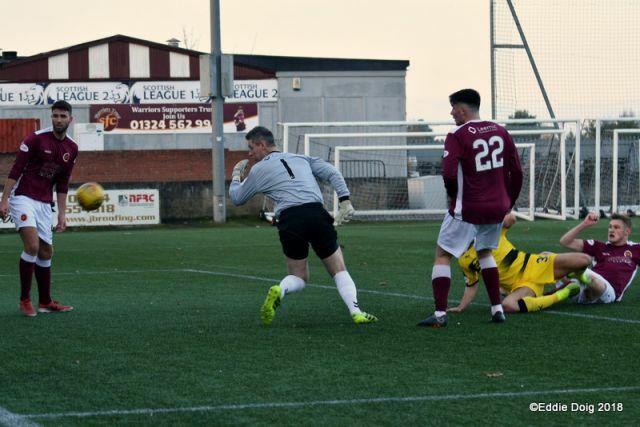 Nisbet gives the keeper a memento as his shot rattled his chest. Thomson dives lowto gather a fierce shot from Paton. 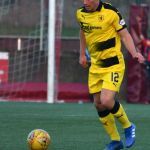 Duthie over the ball 35 yards out skies his free kick wide. Crane on the ball, Rovers press in numbers but Nisbet contrived to shoot wide from vlose in. Armstrong getting his second of the game with a shot from outside the area. Flanagan going just wide from 20 yards. +4 Full Time from Ochilview. 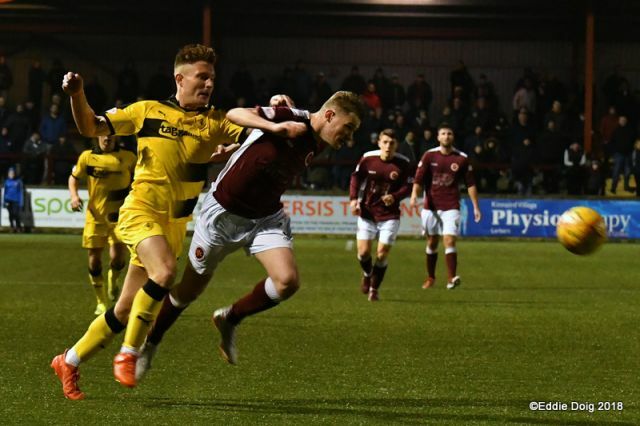 Stenhousemuir 1-3 Raith Rovers. Apologies for the lack of updates earlier, this was due to a fault with the server. 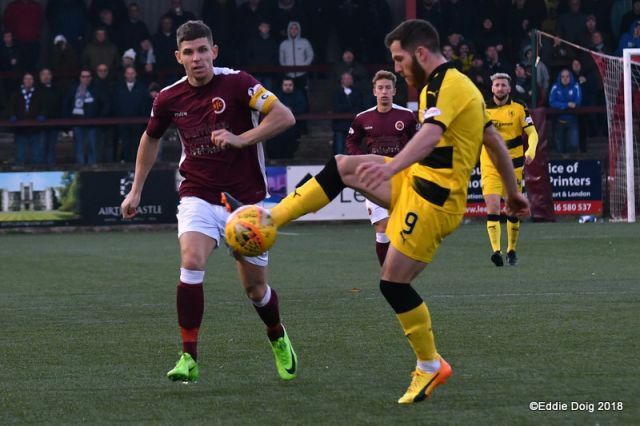 Smith, Reid, McBrearty, Neill, Donaldson, Gibbons, Ferry, Duthie, Paton, Dickson, McGuigan. Subs, McMinn, Garcia Tenna, Halleran, Paterson, O'Hara, McMenamin, Vaughan. Thomson, Crane, Davidson, Murray, Benedictus, Buchanan, Matthews, Nisbet, Flanagan, Watson, Armstrong. Subs, Silva, Milne, McKay, Stevenson, Valentine, Bowie. 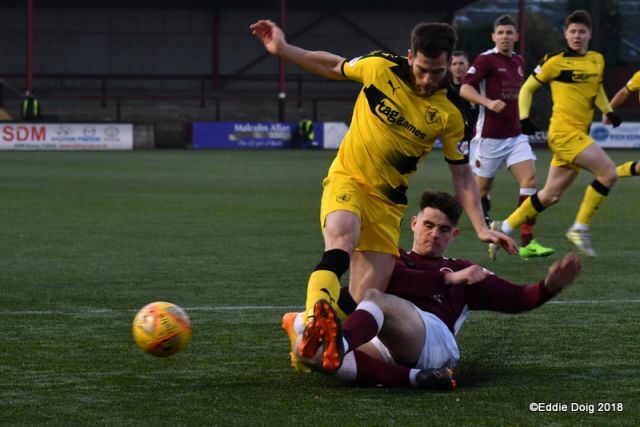 Raith Rovers take on Stenhousemuir on league duty for the first time in 15 years this weekend, with John McGlynn’s men looking to put their away day blues behind them. 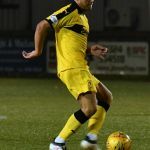 Rovers have won just twice on the road, and with four League One sides picking up more points on their travels than Raith this term, it’s a situation which will need to improve if Rovers are to return to the second tier. 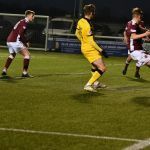 The Warriors currently sit at the foot of the table, although the dismissal of Brown Ferguson from the manager’s position after three years came as something of a surprise, after he led them to promotion last term. 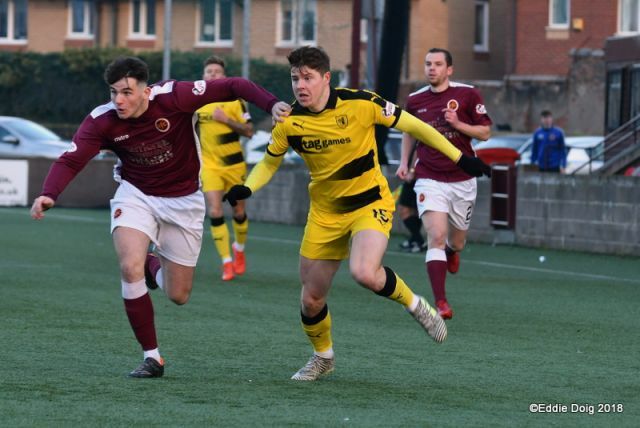 However, in an evenly contested division which can change dramatically from week-to-week, the Ochilview side lie just four points behind fifth place Brechin City and two points from safety. 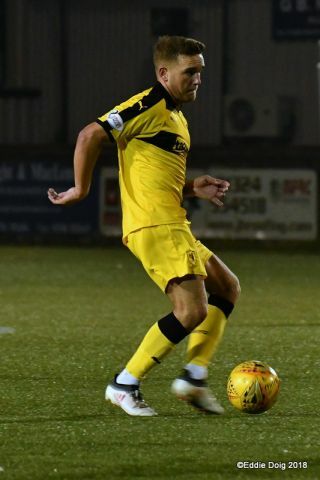 Rovers came out on top in the only other meeting between the sides this term, with Kevin Nisbet scoring a brace in a 2-0 win for the home side, however, they did lose by the same scoreline on their last visit to Ochilview, with Alan Cook and Stephen Stirling the scorers in a Challenge Cup tie back in 2015. 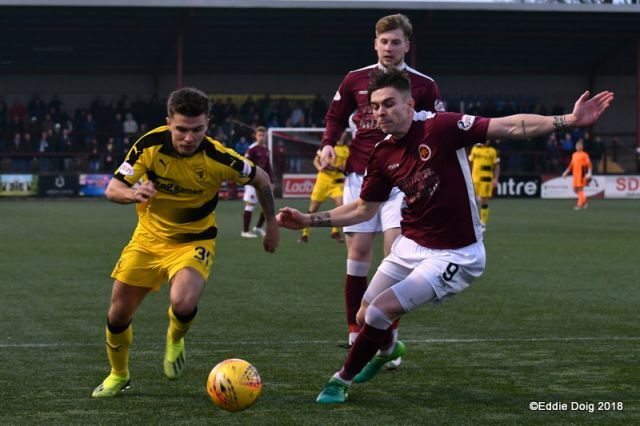 There’s only been one draw in the last 18 meetings between these sides, so the chances are there will be a winner on Saturday, and the most recent record between the pair is reasonably even, with six wins and four defeats for Raith in the last 10 meetings.